Social media – The instrument of communication. It helps us to reach to new people, connect and interact with them. Social media is a tremendous tool that helps you to grow your business and help it to reach to billion of people out there. When it comes to making a strong presences in social media so that you can encourage more and more people to get acquainted with your business, contents and other services, you have to follow several strong strategies. Strategies that will help you to stand out and visible to more people. There are several dos and don’ts in social media. You have to very careful about these things and work on that to create an effective vibe in social media. You can build a good reputation in social networking websites by avoiding some pesky mistakes that you generally make. Interaction is a very important thing. You can get to know about people’s thinking about your business. But when you are new in the social network don’t expect people to start conversation with you from their side. You have to interact with people from your side by asking questions, quizzes and taking surveys at your social networking profiles. When you start interaction with people they feel involved with you and most often keep interacting with you in future which is a good thing. Because a social media profile with so many interactions is highly visible to people. Again when someone starts conversation with you from their side never avoid them always respond to their queries gently. If you are avoiding people who are trying to interact with you they feel neglected and take it as a rude behavior and there are high chances they will un-follow you in social networks. Which is very terrible thing for your social media reputation. It is true that your social networking fan/business pages and profiles are meant for promoting your products and contents. But always concentrating on a single niche or getting too salesy is a big no. When you always post about a single niche it gets boring and your social networking page loses it charm. Social media is for interacting with people. When you always use social media to sale your products people, the main thing interaction with people diminishes. People become less responsive to you at social media as time goes by. You have to take special care of these above mentioned problems to increase people’s responsiveness towards your social media pages. Don’t always post about your niche or business always try to pull out a topic about a popular TV series or newly released movie. Who doesn’t like TV series or movies? By posting something out of topic sometimes is a wise idea. It is refreshing and people get entertained by that. This kind of activity will create a very refreshing social media environment and help your social media pages to get more response from people. This is a big mistake people do. When they get started with social media they worry way too much about getting bigger. For example worrying about getting more likes for your Facebook page but you are just getting started with it. Gaining large number of fans and followers is not an easy task you have to do hard work for that. But a simple but best way to establish more connection with people in social media is connect, like and follow people who like you or follow you. When you are new in social media with less fans or followers just follow or like back your fans. Because you are new and not so many people know you. If you don’t follow them back then there are high chances that you get un-liked or un-followed by them. Always remember that connecting back with people who are connected with you is a great strategy to increase your social media fan base. People don’t like repetition in posting of same old contents again and again. This makes your social media pages annoying and people lost their interests in coming to your page because of lack in new stuffs. People love to stay updated with new information. But when they see a social media page bringing on old stuffs again and again they just get bored so badly and reduce their responsiveness towards your social media page. How do you feel when a TV show repeat its old episode again and again? Believe me I was so annoyed by the repeat telecast of old episodes of “Phineas and Ferb” again and again. I know you also feel the same way when a old episode repeats gain and again. You are doing the same thing in social media broadcasting new contents not TV shows (LOL). Always try to come up with new stuffs don’t repeat the old stuffs and keep people get attached to you in social media. 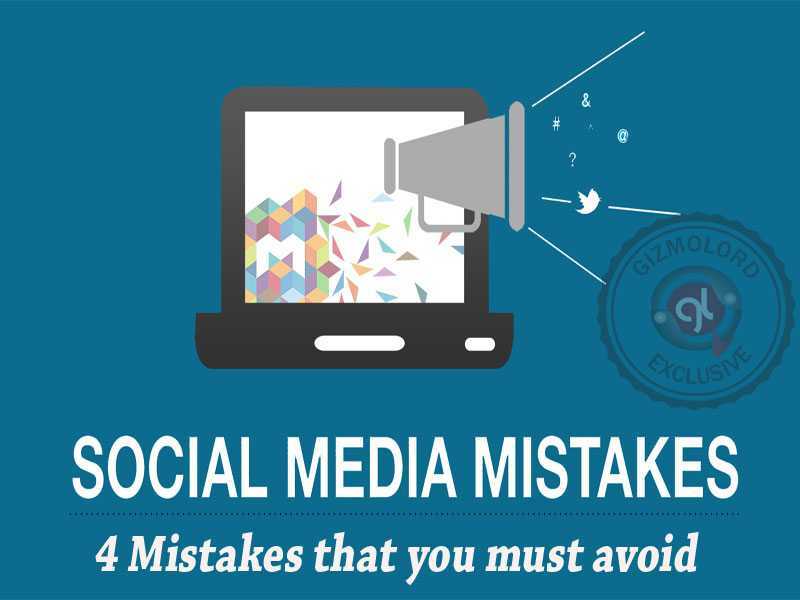 The above four points I have explained are the most common mistakes made by people in social media. Good social media standing is the key to success for everything you are doing in the internet, it may be business, freelancing, promotions etc. So try to overcome these four common drawbacks to grow stronger and establish a successful business, website or blog.